Stac Pollaidh Walk, Loch Lurgainn, Cul Mor, Fionave, Canisp, Suilven and Quinag. It was one of those perfect days. Heading north from Ullapool in the car, I glanced across a small roadside lochan and spied the unique form of Stac Pollaidh in the distance. The craggy little peak rises from the moorland of Inverpolly Forest, resembling one of those ancient mountains one might expect to see in a film like Jurassic Park. A mental note was made to return and scale its rocky flanks and little time passed before I was back. A walkers' car park sits up from Loch Lurgainn. From here a well trod path rises over the hillside, climbing increasingly steeply as you rise directly to the summit ridge. Due to its popularity, Stac Pollaidh has suffered terribly from erosion but thankfully steps have been take to repair the path, removing the worst sections of bog lower down and repairing boot damage higher up. The way becomes increasingly stony as you gain height and, although short at a little under a mile, it is pretty strenuous. The summit ridge gained, there are breathtaking views over some of the wildest country you will find in the UK. Panoramas extend east across the Inverpolly National Nature Reserve to Cul Mor and Fionaven in the distance. 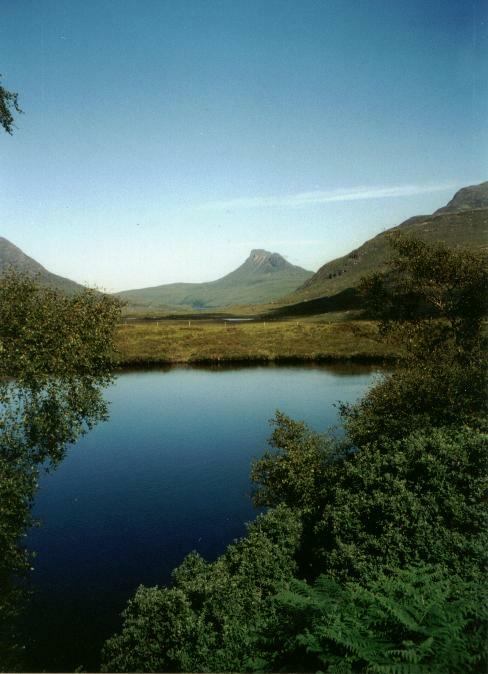 Canisp, Suilven and Quinag are also clearly seen on a good day. The highest part of the mountain - the western peak at 2011 feet high - requires some exposed scrambling along the top of the ridge, or by a path which winds through a series of spectacular turrets and pinnacles. The most difficult bit is the mauvais-pas, a five metre rock step which requires some scrambling experience. There are good hand holds and if you can keep your nerve, there should be no problems. Care is needed as this is a potentially dangerous spot. From the western top, retrace your steps to the top of a sandy scree run down the northern slope. This leads down to a path which skirts round the hill and leads back down to the start. Map OS Landranger 1:50,000 sheet 15. Start/parking Inverpolly Nature Reserve car park (grid ref NC 108095).